I am mechanically impaired. Closing a tea ball is difficult. Manual can openers are Chinese puzzles to me. So it’s no surprise that I left my new Instant Pot in the box for several months before unpacking it. I could sense trouble. The good news is that I did eventually unpack it and on Saturday cooked pork carnitas for tacos in 11 minutes. Unbelievable. Of course, that doesn’t count the 15 minutes it took for the Instant Pot to “come to pressure” or the 15 minutes to reduce the sauce after cooking. But still. The bad news is that my first test of the pot — a venison roast — was a disaster. I read the instruction book cover-to-cover but the pressure gauge is so weensy that I never did see it pop up (it pops about an eighth of an inch, I later determined). I was afraid to remove the lid so I left the roast in the pot for two hours, during which time it continued to cook (not “keep warm”) until even the dog wouldn’t eat it. My second try last weekend went more smoothly but still had glitches. For example, it took me 10 minutes to figure out how to lock the lid. Yes, I had locked it before. Don’t judge. Will I use my Instant Pot again? Yes, but only because so many of you do, and I feel obligated to provide recipes. I know many of you have bought Instant Pots because the multi-cooker is a genuine phenomenon. Sales began surging in the summer of 2016 and rose so fast — by word of mouth and primarily through mail order on Amazon — that the item was named product of the year for its increase in market share. A group of engineers formed the Instant Pot Co. in Canada in 2008 to design an electric pressure cooker with built-in safety controls that old stove-top pressure cookers do not have. In other words, this is not your mother’s exploding pressure cooker. The Instant Pot will automatically shut off before the pressure reaches a dangerous level. The pot also can be used as a slow cooker, rice steamer, yogurt maker and probably a coffee pot. But it’s the fear-free pressure cooker function that excites most buyers. The Instant Pot and its imitators are available in stores as well as online, in a variety of sizes and with varied features. I will not provide a buying guide here; plenty of information is available on the Internet. As a neophyte myself, neither will I instruct you in its use. An excellent primer has been written by Melissa Clark of the New York Times at: https://cooking.nytimes.com/guides/46-how-to-use-an-instant-pot. Her cautions include cutting way down — by half or two-thirds — the liquid in a regular recipe when making it in a pressure cooker. Liquid does not evaporate. Another crucial tip is to make sure the vent on the lid is not just turned off, but is locked in place before programming the pot. This is a step that is glossed over in the instruction booklet, and is overlooked by many first-time users. Me, for example. If anyone has a good Instant Pot recipe or would like me to adapt a favorite recipe to the Instant Pot, send it to me. I can’t print or adapt them all, but I’ll do what I can. Meanwhile, try my 11-minute carnitas recipe. With the additions I suggest, you can make one of those trendy, upscale tacos for a fraction of the cost in a restaurant. I snuggled the carnitas — little glazed cubes of meat — in corn tortillas briefly fried in a skillet just long enough to change the texture of the tortillas (I dislike those crumbly raw things) but not enough to make them crispy-stiff. The meat is topped with quick-pickled onions, crumbled Mexican cheese, cilantro and a squeeze of lime. The final touch is a spoonful of the spicy reduced carnitas cooking liquid. Yeow. I bought the crumbly cheese, queso fresco, at a Mexican grocery store. You could substitute feta if desired. If you don’t own a pressure cooker, the carnitas recipe may be adapted to stove-top cooking. Just toss the carnitas ingredients into a pot with double the liquid and simmer the meat and spices over low heat, covered, until the meat is tender. Remove the meat and boil the liquid until it is reduced to about 1 cup. 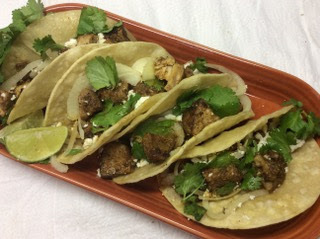 The inspiration for the carnitas, although not the exact recipe, is from Coyote Cafe by Mark Miller. Cut pork, including fat, into 3/4-inch cubes. Place in pressure cooker pot with the water, chile powder, salt, garlic and onion. In a dry skillet over medium-high heat, toast the fennel, cumin, cinnamon stick and oregano, shaking pan often, until spices are fragrant, about 2 minutes. Grind spices (including cinnamon or canela) in a spice grinder to a powder. I use a small coffee grinder I reserve for that purpose. Stir spices into meat mixture. Lock lid into place, lock vent in closed position and program Instant Pot for the “meat” setting, then immediately adjust the time to 11 minutes. After the time expires and the gauge pops up, vent the steam manually and remove the lid. The meat should be very tender. If not, replace the lid, reprogram and cook a few minutes longer. When done, remove meat with a slotted spoon and set aside. Re-program Instant Pot to sauté and cook, stirring occasionally, for 10 minutes. Return meat to pan and cook a few minutes longer, until the meat is glazed with the sauce. Transfer meat to one bowl and sauce to another. Makes enough for about 20 tacos. Note: If your pressure cooker does not have a sauté function, transfer meat and sauce to a pan and boil on the stove, uncovered, until meat is glazed and sauce has reduced to about 1 cup. Cut the onion into very thin horizontal slices. Place in a small bowl with the vinegar and water, submerging the onion. Let stand while preparing the tacos. Heat a scant quarter inch of oil in a skillet large enough to hold a corn tortilla. When hot, cook the tortillas one at a time in the oil, turning with tongs and folding in half. Cook just until the tortillas are blistered but do not brown. Drain on paper towels. Place a thick layer of carnitas in the bottom of a taco shell. Top with 1 to 2 tablespoons of cheese, some of the drained onion, some cilantro and a squeeze of lime. Drizzle with a spoonful of the carnitas sauce. Continue with remaining taco shells. Makes 8 tacos, or 4 servings, with meat left for about 16 more tacos. Coconut curry chicken soup; pork loin roast with apple-corn bread stuffing and cider cream sauce, kale sautéed with garlic; pork carnitas tacos with queso fresco, pickled onions and lime; two sugar-free pumpkin pies. Half of a steak and bacon sub from Subway; half of a chicken and avocado melt sandwich and an apple at Panera; an Indian buffet (samosa, hot pepper pakora, chicken tikka masala, curried eggplant, naan) at Bombay Sitar in Jackson Township; pepperoni pizza from Rizzi’s in Copley Township; a chili dog with onions and french fries with chili and cheese at the Hot Dog Shoppe in East Liverpool. For those who find your peanut butter and tomato sandwich combination appalling — don’t knock it if you haven’t tried it. I’ve been eating peanut butter, tomato and mayo sandwiches for as long as I remember. I’m 83 years old now and can’t wait until home-grown tomatoes are in our stores. That sandwich is probably my favorite of all time! I dig PB and tomatoes, too. PB with sharp Cheddar on Italian bread is surprisingly tasty, and PB with Clausen dill pickle sandwich slices (patted as dry as possible) is an old favorite. Nope, not pregnant; just a fan of some weird combos. Dear Shirley and Rachel: Thanks for helping me feel normal. And you may want to try PB and thin-sliced onion some time. I was reading your pumpkin pie mug recipe and wanted to know where you are finding superfine sugar. I have searched high and low with no success. Can’t wait to see more of your mug recipes. Hopefully, some are waist-friendly. Dear Michele: I wish. All of the recipes are desserts. Not a low-cal number among them. As for superfine sugar, that’s one of the many quandaries I faced while writing the book. I used superfine sugar because it dissolves quickly — a plus when the cooking time is just 1 1/2 to 2 minutes. 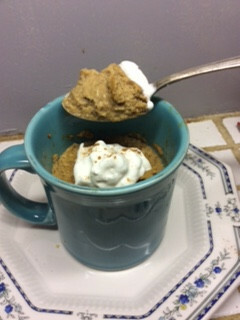 Microwave mug cakes made with regular sugar are gritty, I found. But a couple of years into testing recipes, I suddenly couldn’t find superfine sugar in stores anymore. Domino and a couple of other manufacturers were still making it, but most stores didn’t sell enough to justify the shelf space, I was told. The solution, if you’re unable to find the sugar, is to grind some regular sugar in a food processor. Process 1 cup plus 2 tablespoons of granulated sugar nonstop for 30 seconds to produce 1 cup superfine sugar. A couple things going on. The first has to do with aged balsamic vinegar, which can be expensive. America’s Test Kitchen says you can “age” your own. Actually, it’s just a reduction but tastes identical to an aged one I recently sampled. To an uneducated palate such as mine, it was fine. In a small saucepan combine 1 cup inexpensive balsamic vinegar, 3 tablespoons sugar and 3 tablespoons ruby port. A 4-inch sprig of fresh rosemary is optional. Heat just below a simmer until reduced by about half. I made two batches, one with rosemary and one without. Both were delicious, but the one with rosemary was outstanding. On another note, I despise beets — always have. I think they taste like dirt. But I found a recipe that makes them tolerable if not good. I made this recipe with the non-rosemary vinegar. Line a cake pan or other oven pan with foil. Splash in about 1/4 cup water, add the beets and seal with foil. Bake at 375 degrees for 45 minutes or until tender. Test by piercing with a sharp knife. Remove from oven. When cool enough to handle but still warm, peel beets and cut into thick slices. Melt butter in a saucepan over medium heat. Add ginger and cook for a minute or two, just until fragrant. Add beet and vinegar and cook until beets are hot and glazed. Stir in honey. Just thought I’d share and see what you thought (and maybe a wine suggestion). Dear Cheryl: I like beets BECAUSE they taste like the earth. Not dirt. Earth. See how I make them palatable? It’s all about perception. As for wine, how about a big, earthy, fruit-forward zinfandel such as Ridge? I like the “aged” balsamic recipe. Real aged balsamic is beyond expensive. Remember the cookbook I was writing? After four years of testing microwave dessert recipes in three different ovens and another year of writing descriptions, chapter intros and cautionary how-tos, I flamed out. The book is so close to the finish line that to drop it at this point would be nuts, so call me nuts. I can’t. Write. Another. Word. The good news is that I’m left with almost 100 original, rigorously tested recipes for single-serve cakes, pies, crisps, custards, cheesecakes and bread puddings that can be made in about 5 minutes in a microwave oven. I had to invent a few techniques to get the textures and flavors I wanted. For example, I found that microwaving the cakes on 50 percent power instead of 100 percent gives the leavening more time to work and helps eliminate the rubbery texture most other microwave mug cakes have. I haven’t seen my methods in other sources, or tasted microwave mug desserts this good, so I hate to let the recipes languish in my computer. My solution is to share the recipes with you in this newsletter. I have shared a couple of recipes in the past and will share many more in the coming months. This week I’m offering a recipe for microwave single-serve pumpkin pie. If it is one of the two or three mug recipe I’ve printed before, forgive me. It didn’t turn up in a search of my columns, so I think I’m safe. The microwave pumpkin custard/pie recipes I’ve tried from the Internet are awful — bland and loose-textured, like warm pumpkin from the can. Don’t be intimidated by the number of ingredients in my recipe. They are all necessary to produce a 5-minute microwave pumpkin pie that tastes like it came from your regular oven. The measuring goes quickly, and the result is worth it. I’m also sharing my microwave mug recipe for a moist banana cake. I found that most Internet mug cakes I tried had a rubbery texture that hardened if left overnight. If you can resist eating this banana cake hot from the oven, it will taste just as good the next day. The size, shape and composition of your mug, along with the power of your microwave, makes a difference in the timing of the recipes. I tested the recipes in 1000-, 1100- and 1200-watt ovens, and used 12-ounce Fiesta ceramic mugs. I provide microwave times but also describe what the surface of the dessert should look like when it is done. Adjust the time if necessary. For the crust, place butter in a 12-ounce ceramic mug and microwave on high power for 15 to 20 seconds or until butter melts. Stir in sugar and graham crumbs. Press evenly into the bottom of the mug. Set aside. For the filling, combine butter, pumpkin and sweetened condensed milk in a glass measuring cup. Microwave on high power for about 30 seconds, until butter has melted. Stir well. Stir in sugar, cornstarch, cinnamon, ginger and cloves. Pour over crust in mug. Microwave on 50 percent power for 2 minutes, or until the top is mostly dry except for a dime-sized circle in the center. The filling will be loose. If eating right away, first chill in a freezer for 10 minutes to set the custard. If eating later, chill completely in the refrigerator. Dress it up: Top chilled pie with a dollop of whipped topping and pinch of nutmeg. Even better: Beat a half-teaspoon of Bourbon into the whipped topping. In a 12-ounce ceramic mug, beat butter and sugar with a fork until fluffy. Beat in corn syrup, egg yolk, banana and vanilla until thoroughly incorporated. Add flour, baking powder and salt and beat about 50 strokes, until very smooth and thick. Scrape batter off sides and smooth top. Microwave at 50 percent power for 2 1/2 minutes in a 1000-watt oven, or 1 minute, 45 seconds in a 1100- or 1200-watt oven. Adjust time up or down for lower or higher wattage ovens. Eat directly from the mug or, if desired, immediately run a knife around the edge of the cake and invert onto a plate. Dress it up: Sift confectioners’ sugar over the cake. Even better: Stir a tablespoon of mini chocolate chips into the batter before baking. Chicken with sautéed peppers over ditalini pasta with wilted spinach and mascarpone cheese from Blue Apron; oven-roasted potatoes and green beans with leftover pot roast; two sugar-free pumpkin pies. Delicately crunchy fried perch, coleslaw, applesauce at The Boulevard in Cuyahoga Falls; arepas with chorizo and green salsa, and a taco with duck confit, roasted red peppers, kale and goat cheese at Crave Cantina in Cuyahoga Falls. Low-cal, high-protein ice cream is a hot category in grocery stores at the moment. The ice creams (technically frozen desserts because they don’t contain enough fat to legally be called “ice cream”) are sold in pint containers that are about 230 to 350 calories for the whole thing. The only problem is they’re expensive. The ones I’ve seen cost about $6 a pint. The exception is a new entry in the category, Breyers delights. The various flavors contain 20 grams of protein and range from 260 to 330 calories a pint. They cost about $4. Currently they’re available at Giant Eagle stores. I tried two Breyers delights and they’re pretty good. Still, as I’ve pointed out before, you can make your own high-protein, low-cal ice cream by freezing a protein shake made from a low-cal protein powder such as Pure Protein. It won’t cost $4, either. I can’t wait to return to Crave Cantina and work my way through the menu. The Cuyahoga Falls restaurant is the brainchild of Aaron Herve, the chef who owns Crave in downtown Akron. He calls the food globally inspired Latin fare so as not to pigeonhole it too narrowly. Tacos are the main event, but nothing you’ll find in Mexico. The imaginative fillings range from buttermilk fried chicken with kimchi, Korean bbq, Japanese mayo and house-made pickles, to smoked brisket with fried potatoes, pickled red onion, white Cheddar, horseradish and pasilla pepper pesto. The 13 taco varieties are $3 and $4. The menu also includes salads, sandwiches, a handful of entrees (paella Cubano with mussels, scallops and shrimp is $19), seven kinds of guacamole and nine appetizers. I loved the arepas, although the unstuffed cornmeal disks were unlike any I’ve had before. For the next trip, I have my eye on the Latin poutine (yucca fries, chorizo, queso fresco, pickled chilies and cumin veal gravy, $9) and the Jamaican curried chicken empanadas, $8. The restaurant is at 2097 Front Street, in the middle of an ongoing street construction project that makes getting to the place a challenge. I suggest you park behind the restaurant in one of lots on Riverfront Parkway and enter through the back door. The Cantina is open evenings only. Is the Stray Dog (last week’s newsletter) like the Hot Dog Shoppe in East Liverpool? Have not stopped there in a few months. Also, the last time we were in Wilmot we stopped at Bee Bobs. The burgers were really good and the fries and onion rings are all hand-cut and fried to order. We will stop there again but hubby and I will split our order next time, it is that large. You may want to check it out when you are in that area. Dear Rebecca: You bet I will. The Stray Dog is a hip restaurant with contemporary, global food — good, but nothing like our beloved Hot Dog Shoppe. Your soup (last week’s newsletter) sounds yummy. I’m a vegetarian so I would leave out the chicken and use a clear veggie broth. It reminds me of a fave Crock Pot dinner with sauerkraut, potatoes and apples (we used to add kielbasa but now add vegan hot dogs at the end). I love sauerkraut. Thanks! Dear Linda: Thanks for telling folks how to make my soup recipe vegetarian-friendly. Re: your review of meal kits — I’ve been using Home Chef for a few months, and overall have been pleased. On the “steak” dishes, the meat has not been the tenderest. I’ve been really busy at work and this is a nice alternative as I get tired of eating out, which is the easy way out after an extended work day. Have been amazed at the flavor you get with just a few ingredients. It’s also nice to have it delivered and mostly prepped. From Cynthia P.: I prefer Blue Apron. Fresher veggies. Much better packaging. More spices . More layers of flavor. Better directions. Healthier food overall. I didn’t like that Hello Fresh used chicken base in recipes and less olive oil. And now I have more choices on Blue Apron. After a few weeks of Hello Fresh it got boring. I switched back and forth but will do more Blue Apron. Just read about your experiences with meal delivery kits. I also recently became interested in this service. I don’t mind cooking at all, it is the meal planning and shopping that I consider to be a chore. There are only so many hours at the end of a work day and I would prefer to use the extra ones on other things. I started with Hello Fresh, too, and was pleased with the whole experience. I love that I can come home and pull out all the ingredients for a meal in one handy package, rather than running circles around the kitchen from the fridge to the pantry collecting all ingredients. I also like that I don’t need to purchase a whole jar or bottle of an ingredient I may or may not use again. We were very pleased with the quality and taste of the Hello Fresh meals. However, I recently stumbled onto SunBasket. It’s a little more expensive than Hello Fresh at about $12 per serving (they also charge for shipping) but the draw for me is the recipes. They have so many more meals that are “paleo” protein/vegetable combos, rather than including a starch such as rice, noodles, etc. This was very appealing, and as it turns out, delicious, too! Plus, I’m cooking meals that I would not have considered had I needed to start from a recipe. We are on our fifth week with SunBasket and have not been disappointed in a meal yet. Seriously Jane? Peanut butter and sliced tomato on toast? Make a syrup by combining sugar, water, cinnamon, nutmeg and butter in a saucepan. Cook and stir over medium heat until sugar dissolves. Set aside. In a food processor, combine salt, flour and baking powder; pulse to mix. Cut shortening into bits and add to the flour mixture, pulsing until bits of fat are the size of peas. Drizzle in enough milk, pulsing, to form a soft dough. Dough also may be made by hand by cutting the shortening into the flour mixture with a pastry blender, and tossing with a fork while adding the milk in a drizzle. Gather dough into a ball and chill. Roll or pat dough into an 11-by-15-inch rectangle. Spread apples over dough. Beginning at a long edge, roll up jelly-roll fashion. Pinch seams to seal. Cut pastry log into 1-inch slices. Place in a buttered, 9-by-13-inch baking pan. Pour syrup over all. Bake at 375 degrees for 30 to 40 minutes, until browned and bubbly. Serve warm with whipped cream, if desired. One of my favorite fall dishes is a skillet ragout of chicken and sauerkraut simmered with onions and apple cider. What if I turned the ingredients into a soup, I mused last week? Yes, it can be done and the result is delicious. I like the slightly sour edge to this soup, which I ate for lunch, dinner and even one day for breakfast. 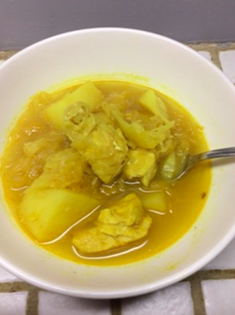 You’ll notice that the soup is a lovely golden yellow, due to the totally unnecessary turmeric I added for its anti-inflammatory properties. Turmeric doesn’t impart much flavor, so if you’re young and vigorous or you just don’t give a darn, you can leave it out. By the way, you can buy big pouches of turmeric at bargain prices in the many Nepalese grocery stores that dot the North Hill area of Akron. I frequent Family Groceries at 768 N. Main St. If you have sour cream on hand, add a dollop to each portion before serving. Heat 2 tablespoons of the oil in a soup pot. Season chicken with salt and pepper. Brown in oil on all sides. Remove with a slotted spoon and set aside. Add remaining 2 tablespoons oil. When hot, sauté onions and apple slices over medium heat until the edges begin to brown. Return chicken to pot. Add paprika and turmeric and stir and cook 1 minute. Add vinegar and bring to a boil. Stir in sauerkraut. Add potatoes and broth. Bring to a boil, reduce heat and simmer uncovered for 30 to 45 minutes. Makes 8 servings. Note: If the soup is too tart for your taste, stir in 1 tablespoon brown sugar. And the winner is….Hello Fresh. I haven’t tried every meal delivery kit on the market, but of the two I tried this month, I prefer Hello Fresh. Two different friends signed me up for free three-day trials of Blue Apron, the industry leader, and Hello Fresh, and Tony and I had fun trying them out. For those who have been living under a rock, meal delivery kits are three or four day’s worth of ingredients and recipes shipped in a big box to your door. Everything is included, from tiny bottles of sesame oil to well-iced packages of fish, chicken and beef. All you have to do is follow the easy-to-use instructions for making the meals, none of which takes more than 30 minutes to assemble. Customers may choose among offerings that change weekly. My Hello Fresh meals were spicy ground beef tacos with quick-pickled vegetables; creamy Dijon chicken with roasted green beans and oven-fried potatoes; and sesame shrimp stir fry with ginger rice and roasted green beans. The Blue Apron meals comprised penne pasta Bolognese, crispy buttermilk catfish with sautéed kale and roast delicata squash, and chicken breasts with sweet pepper puree over ditalini with spinach and mascarpone cheese. The meals cost about $9 per person — about $55 to $60 for three days’ worth of meals for two. Family-size subscriptions also are available. The portion sizes of both brands were more than adequate although Tony, the human anaconda, topped most of his dinners with a big bowl of ramen. I would have added more seasoning to some of the dishes, and the cooking processes of the Blue Apron dishes seemed clunky and messy. Overall, the Hello Fresh meals seemed to be better thought out, the food better seasoned, and the recipes more interesting to my palate. Meal kit companies are multiplying exponentially right now, leading me to wonder why local supermarkets don’t jump on the trend. The popularity of the kits proves what I’ve thought for a long time — more people would cook after work if they just had the ingredients and a recipe on hand. That’s the fun part. The hard part is figuring out what to cook, finding a recipe and drawing up a shopping list. I’m interested in other meal-kit companies. Do you subscribe to one? If so, drop me an email. Pan-browned, oven-finished glazed pork chops with sweet soy sauce, roast eggplant with pesto, roast delicata squash and fried ripe tomato slices; peanut butter and sliced tomato on toast; egg salad; chicken and sauerkraut soup; crispy buttermilk catfish with sautéed kale and roasted delicata squash from a Blue Apron meal kit; penne pasta with beef Bolognese sauce from Blue Apron. Baked chicken, mashed potatoes and gravy, beets and a yeast roll at the Amish Door in Wilmot; homemade potato chips, a mini shredded beef hand pie, and a coney dog with mustard and relish at Stray Dog City Tavern in Akron; dried tomato and goat cheese canapés with figs, creamy clam chowder, ham tetrazzini and sticky toffee pudding with vanilla ice cream (wow) at my friend Joan’s; cheeseburger and fries at Five Guys. Note: I came across Stray Dog City Tavern when I was searching for a local coney dog restaurant. It is a real find, although owner Charlie Murphy says he has owned the restaurant for a year. Before that he operated the cafe in the main Akron-Summit County Public Library in downtown Akron. He started out eight years ago with a hot dog cart, and still operates three Stray Dog carts in the area. The restaurant is in a hip, updated space near Temple Square. The menu is pretty hip, too, with items such as scallop tacos, mussels with Guinness stout and hot dogs topped with crawfish, slaw, and Sriracha mayo. The big, all-beef dogs come a variety of ways, although none of the variations are on the menu. You have to ask. “We make up new stuff every weekend,” Murphy says. Two of his burgers, including his Punch In the Mouth Burger, took prizes at this year’s National Hamburger Festival downtown. Punch In the Mouth burger is topped with Cheetos, pickled jalapeños and Wrath of Dog sauce. All of Musrphy’s food, from the hot sauce to the potato chips and onion dip, is made from scratch. Check out the menu at akroncitytavern.com. No! Don’t use your Instant Pot for canning. Very bad idea. Dear Susan: Thanks so much for setting us straight. In fact, the Instant Pot may be used for boiling water bath canning but not for pressure canning, in which the pressure must reach 15 psi and the temperature must be maintained at 240 to 250 degrees. Pressure canning is mandated for low-acid foods such as meat, poultry and vegetables. The problem is that the Instant Pot is regulated by a pressure sensor instead of a thermometer. Elevation above sea level can affect the temperature of food under pressure, so the exact temperature of the food inside the pot cannot be determined. The caution applies to other brands of pressure cookers, also. Thanks for the interesting and helpful recipes. Would you share your recipe for apple dumplings? “Thousands of blushing, naked apples are heaped in Ohio’s roadside markets this week, just waiting to snuggle into a warm blanket of pastry. Geez, I wish I could still write like that. In a food processor, combine salt, flour and baking powder; pulse to mix. Cut shortening into bits and add to the flour mixture, pulsing until bits of fat are the size of peas. Drizzle in enough milk, pulsing to form a soft dough. Dough also may be made by hand by cutting the shortening into the flour mixture with a pastry blender, and tossing with a fork while adding the milk in a drizzle. Gather dough into a ball and chill. I have made apple pie, apple turnovers and apple tarts; apple dumplings, apple cake and apple mousse. But I had never made apple kuchen until last weekend, when I came across an old recipe card and decided to remedy the omission. “Kuchen” means cake in German, and there are as many types as the generic term would suggest. 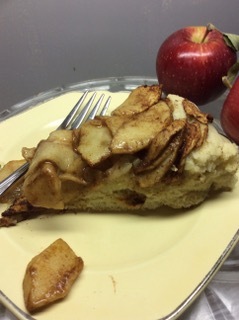 Most apple kuchens, judging from recipes I found on the Internet, are baking powder quick breads whipped up in a jiffy, with sliced apples either folded into the batter or arranged in a pattern on top. The sort I made was a lesser-known, yeast-raised coffee cake that takes a bit more forethought. The butter- and egg-rich dough must be kneaded and raised twice, but it produces two handsome loaves you’d be proud to serve anyone. I divided up the prep time by making the dough one day, refrigerating it overnight for the first rise, and shaping and baking it the next. A word to the wise: Because of the butter and eggs, the rich dough will not rise as high as regular dough. In fact, you’ll be lucky if the dough rises at all the second time, after it is shaped and in the pans. It will just look a bit puffy. Sprinkle yeast over warm water in a small bowl or measuring cup. In another measuring cup, bring milk almost to a boil in a microwave, then pour into a mixer bowl with the 1/2 cup butter, 1/4 cup sugar and salt; cool to 110 to 115 degrees. Add softened yeast mixture, grated lemon rind and eggs. Beat with the paddle beater of a stand mixer until combined. Add flour a little at a time while beating on medium-low speed. Add just enough flour to produce a soft dough. Exchange the paddle beater for a dough hook and knead with the mixer for about 10 minutes, adding more flour if necessary to prevent stickiness. Scrape dough onto a counter and shape into a ball. Wash and dry the mixer bowl and coat the insides with oil. Place dough in bowl and turn the dough to grease all surfaces. Cover with plastic wrap and refrigerate overnight (or let stand in a warm place until doubled if making the kuchen immediately). Remove dough from refrigerator and bring to room temperature. Punch down dough, remove from bowl and divide in half. Shape each piece into a 10-inch disk. Place each in an oiled, 10-inch-round cake pan. Brush with melted butter. Cover with plastic wrap and set in a warm place until dough looks puffy. Remove plastic wrap. Peel apples and slice very thin. Place in a large bowl with the 1/2 cup sugar and the cinnamon. Toss well. Spread half of the apples on each round of dough. Dot with the 2 tablespoons butter. Bake at 350 degrees for 50 to 60 minutes, until apples are soft and bread is cooked though. Cool for 10 minutes before cutting into wedges. Makes 2 coffee cakes. What IS necessary is making sure any liquids added to yeast are no hotter than 115 degrees, the point at which yeast is killed. The temperature range for activating yeast is 110 to 115 degrees. I use an instant-read thermometer held under the hot water tap to gauge the temperature. Note: A friend signed me up for three days of mail-order meal kits from Hello Fresh, which arrived last week. The food was decent, although it could have used more seasoning. The portions were more than adequate for me, if not for Tony. He and I enjoyed making two of the meals together. My friend Elizabeth and I had a great time making the third meal for lunch. She said she would sign up for the service. Another batch from a different purveyor arrives Friday. Roast whole chicken and roasted potatoes, zucchini, yellow squash and cherry tomatoes; hoisin shrimp with crispy green beans and ginger scallion rice from Hello Fresh; chicken salad with walnuts and grapes; sesame beef tacos with quick-pickled veggies and spicy crema from Hello fresh; creamy dill chicken with roasted potatoes and green beans from Hello Fresh; bacon, tomato and spicy mayo sandwiches on health-nut toast. Pierogis, bratwurst, fried cabbage and German potato salad at Mike’s Place in Kent; half of a Southwest chile lime ranch salad with chicken at Panera Bread. I just got a pressure cooker this spring and I only used it four times this summer but I really got it for soups and stews and more winter food. But the first time I used it the meat was done so fast and I hadn’t been watching it that I thought I must have done something wrong so I kept it closed up in the pot and recooked it. Boy, was that roast tender, falling apart but not dry. I’m going to start making some tomato sauce today with the two bushels of tomatoes I have. I’m really happy I got a pressure cooker — but I think I remember my mother having an exploding pressure cooker. Lots of something on the ceiling, but it could be that I remember my mother telling about it, as she wouldn’t use it unless we were out of the house playing or at school. Dear Jill, So you saw that little aside in Gut Check about ruining a venison roast in my first try at pressure cooking? I did exactly what you described — let the pressure cooker sit long after the thingy popped up so that it overcooked. Heck, I couldn’t even SEE the little pop-up thingy because it’s so small and rises only about quarter inch. I was so disgusted — and leery — that I haven’t used my Instant Pot since. I guess I’ll give it another try this winter. I never thought of using it for pressure canning. Good idea. I did find a good primer on pressure cookers (specifically the Instant Pot) written by Melissa Clark of the New York Times. It is at https://cooking.nytimes.com/guides/46-how-to-use-an-instant-pot.